Gunners of the USS Hornet score a direct hit on Japanese bomber, March 18, 1945. The aircraft it a Yokosuka D4Y Suisei. 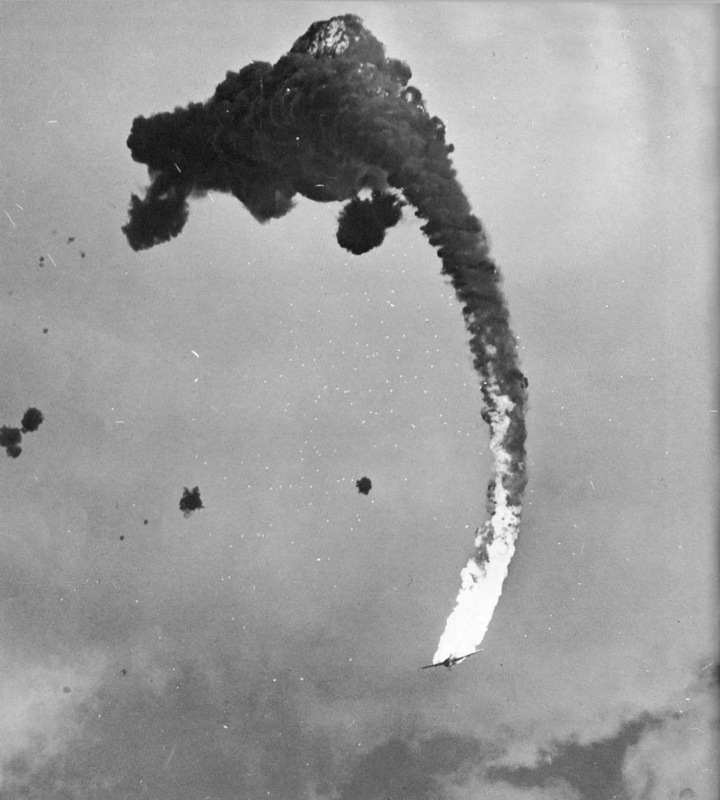 A Japanese plane caught squarely by antiaircraft fire leaves a trail of smoke and flame as it falls toward the ocean. The pilot might have already been dead by the time the bomber was going down; getting knocked out would probably be a small mercy compared to being burnt alive or drowning. There’s a passage from an autobiography of a Second World War British bomber crew member called “In for a Penny, in for a Pound”: he describes that if they were to survive a crash but find themselves completely stuck in a burning wreck, they were instructed to stick their face in the flames and breath in. Their lungs would be incinerated from the heat, making them pass out, allowing a quicker and less painful death than being burned alive. Dive bombers, as the name implies, were aircraft specializing in delivering bombs using a diving attack. By flying along a steep trajectory that closely matched that of the bomb, the dive bomber eliminated much of the error in aim in the direction of approach. As a result, a well-trained pilot could hit his target better than 50% of the time, and the superb Japanese Navy carrier pilots achieved a hit accuracy of better than 80% against the British carrier Hermes and cruisers Cornwall and Dorsetshire in early 1942. It is a measure of how badly Japanese pilot skill deteriorated that, by the end of the war, the remaining pilots were hitting their targets only 10% of the time. Overall, dive bombers scored 20% hits against stationary battleship-sized targets during the war. Part of the wide variation in effectiveness of dive bombers can be attributed to the importance of leadership. Dive bomber formations on both sides attacked in 20- to 30-second intervals behind their leader. If the leader came close to the target with his bomb, the pilots behind him could easily adjust their aim and have an excellent chance of scoring hits. If the leader was wide of the target, the entire squadron might miss the target. Who is sane in a war? "its use declined during the war, when its vulnerability to enemy fighters became apparent"